You are browsing the archive for protests. Carol Hanisch, powerful civil-rights activist starting in the late 1960’s bringing awareness to black oppression, and women suffrage. I found most of my information from her formal website, and from “Daring to Be Bad: Radical Feminism in America,” by Alice Echols, published in 1989. “Daring to Be Bad,” explains how Hanisch worked together with other activist on women rights. Hanisch was born on a farm in Iowa; she graduated from Drake University in the early 1960’s. She started working with the Southern Conference Education Fund (SCEF) around 1966. The SCEF was established in 1946 which was the leading proponent of integration and civil-rights. The SCEF held offices in New Orleans, Louisville, and Atlanta. After working with the SCEF she moved to New York City, and help established the New York Radical Women (NYRW), by the fall of 1968, over one-hundred women had joined the liberation movement (Daring to Be Bad, 1989). These women wanted to fight for their rights that was wrongfully denied to them because of their gender. And in 1968 these women took their stance when they protested the Miss. America Pageant in Atlanta City. Over one-hundred and fifty women from six major cities join them. The huge group of women stood outside and threw feminized items into a trash can: high-heels, bras, aprons, skirts and make up. Hanisch helped some women sneak a banner inside the pageant and shown it to millions on national television. The banner and protest worked, springing huge amounts of attention for the movement. “One of the reasons we came off anti-woman was our lack of clarity. We didn’t say clearly enough that we women are all forced to play the Miss America role-not by beautiful women but by men who we have to act that way for and by a system that has so well institutionalized male supremacy for its own ends.” Carol Hanisch (Page 95, Daring to Be Bad.) The NYRW soon fractured after the huge success from the protest. Hanisch went on to help recreate the Redstockings of the Woman’s Liberation Movement, which is a radical feminist group that was most active during the 1970’s. Redstocking is a compound word red coming from the revolution being created, and “stockings” from the Bluestocking movement of higher intellectual women. The Redstocking’s helped fight for the rights of abortion, funded speak-outs and radicalized thousands of women by distributing movement literature (free of charge), the organization is still being operated today. Carol Hanisch is still promoting equality for women today. Her website contains information over her past achievements, you can read her articles, “Hard Knocks,” and “The Personal is Political.” The site sells online merchandise such as: her own publications, buttons and T-Shirts related to the rights of women. 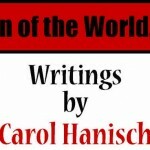 Hanisch writings describe women’s rights for equal pay and to their own body. Carol has worked against racism, U.S. Imperialism, and even spent time in South Africa. She participated in environmental situations, and even saved a mountain from being destroyed and helped turn it into a state park. She currently works as an editor and a graphic design artist. She continues to find practical ways to get involved in the ongoing struggle for women’s liberation. In 1963 a movement led by the Southern Christian Leadership Conference (SCLC), and by Martin Luther King Jr. marched into Birmingham, Alabama. At the time Birmingham was known as one of the most, if not the most segregated cities in the southern states. There goal was to use non-violent demonstrations and make a stand to fight laws that were unfair to African Americans. The thinking was if they could successfully fight segregation in Birmingham, then it would help them fight it everywhere else. I chose to write about the March on Birmingham, because as I learned more about it I was more amazed at how dedicated these people protesting were. They were, not surprisingly, met with police brutality led by one of the most famous supporters of segregation, Eugene “Bull” Connor. Police violently tried to discontinue these protests and sit-ins with jailings, beatings, police dogs, and even used fire hoses to break them up. The demonstrators did not retaliate however and continued to use their non violent demonstrations. What also amazed me while learning about this, was not only how, but who was part of these demonstrations. Of course there were the leaders of the movement including Martin Luther King Jr. (who was also arrested here), but once in Birmingham they recruited students not only from high school but even from Elementary Schools. 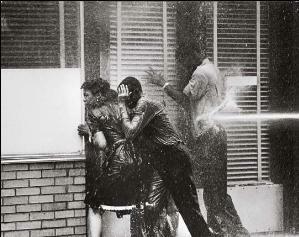 Young children participated in all of these movements and yet were still subject to the police brutality. They were however successful in their movement, by attracting much media attention and slowly began desegregation, and even resulted in Eugene “Bull” Connor losing his job. “We have a Movement” excerpt in Free At Last – The U.S. Civil Rights Movement, “America.gov,” U.S. Department of State’s Bureau of International Information Programs. Accessed 19 November 2010. http://www.america.gov/publications/books-content/free-at-last.html.